We love our Poodles! Niki grew up with Miniature Poodles and Jeff informed her the minute they got married that they would NOT own a Poodle! Then he said a large black one would be okay....and well.....the rest is history! Hailee was our first born Standard and love of Jeff's life until she passed in October 2014. Daisy is a tough little Poo who loves to wrestle with her big sister and play frisbee. Any other time is spent keeping track of Niki whom she adores. She has been to agility and obedience classes. Daisy is black and her Father is from a well respected Poodle program Farthing Poodles. Niki was going to spay her, but her vet talked her out of it. Daisy gave birth to a litter of pups August 17, 2007 (there were two boys and two girls). The sire to Daisy's pups was Pita-P Poodles AM Champion Foxmore Stetson. In January 2010 we added another Standard Poodle to our family from Carrington Poodles. Sicily is from a long line of show winning Standards. Her sister was the number 3 Poodle in Canada for 2011. Sicily however is happy just being a farm Poodle and tormenting Daisy. Sissy had a litter of pups on Christmas Day 2013. While they were cute, they were a lot of work. All of them got super homes that we hear from! We highly recommend Poodles as companion dogs. They are clean, don't shed, smart beyond belief and always entertaining. Our dogs can be lap dogs, but are also happy farm dogs! Do not even bring up the silly "Doodle" crosses to us. What is the point when you can have a real Poodle that is perfect already? Daisy in the middle of our sheared wool discard pile! She is soooo helpful! Sicily Poodle always on a pillow somehow! Yes that is Daisy riding our pack male Toby when we went hiking! We told you she is tough! 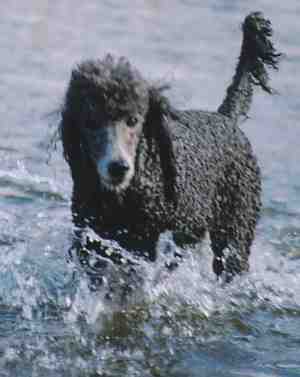 Did we mention Hailee our first Standard Poodle was a serious water dog? 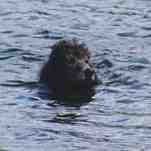 Pictured swimming at the top of Mount Baker Summer 2006. Niki's Dad John is a big part of our lives. Pictured here with Daisy's puppy born 8/17/07. She is named Belle, after the Beauty and the Beast character. Jeff is a horse guy! Since a small child, he has always dreamed of owning his own cow pony. His first horse was a Palomino bought as a wedding gift by Niki. His current horse is a registered Quarter Horse gelding Pepernaut's Tornado. Tornado was also a gift from Niki, after being advised by longtime friend John Mallon to buy him. John had done his training and nicknamed him "Lippy" because of his playful nature. Jeff has been taking reining and riding lessons for years on him. Niki's Grandmother (her Mom's Mother) was a big part of our lives. Her whole life, Niki was always close to her Grandparents. Grandma is 92 years old (born in 1916) in this picture. Grandma used to fish, sunbath, camp, swim, walk and do all kinds of outdoors things. She was pretty darn adorable and we loved her dearly and felt so blessed she was with us for so long. We had an annual date to do the June Portland Oregon Rose Festival Parade. Grandma had attended this parade most of her adult life. As she got older, it became difficult for her to watch. Our solution to this was to take her in the five mile parade in our llama cart. 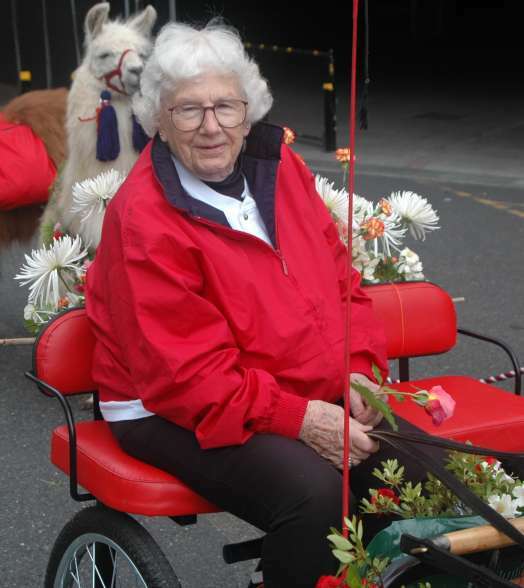 Grandma was a good sport and loved having all her friends say they saw her in the parade being pulled by a llama. Her favorite llama no less.....Eagle! We gave Gramdma Eagle's 2006 National Driving Trophy as he won it the day after her 90th birthday! When we moved to the new farm, we were informed by several neighbors that a cougar roams the area. 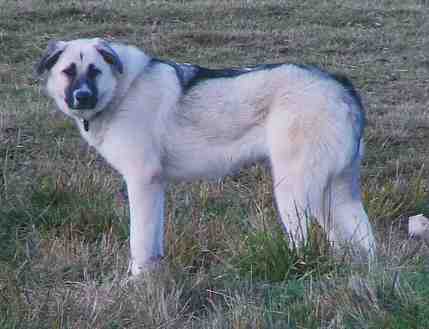 We aren't taking any chances and decided to add two livestock guardian dogs to our crew. The one on the left is a Great Pyrenees/Anatolian Shepherd mix we got from Texas through an ASD rescue group. She loves to play out in the pasture with various treasures she finds around the farm. Bailing twine, rocks, sticks, vet wrap and more are her favorite items to drag out there. 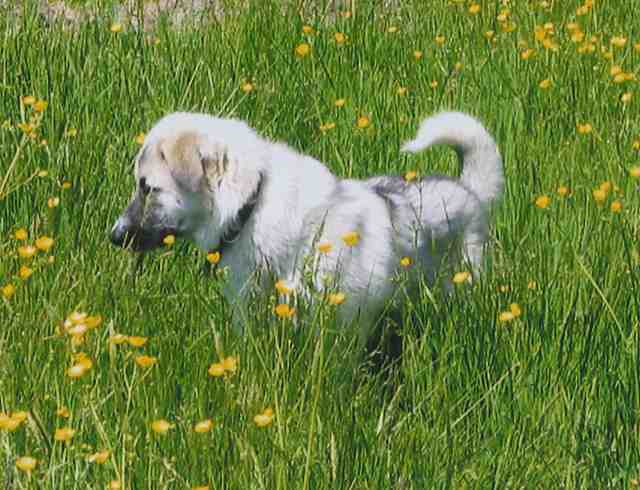 We had a wonderful guardian dog named Aslan, that we lost in December of 2008 to Bone Cancer. 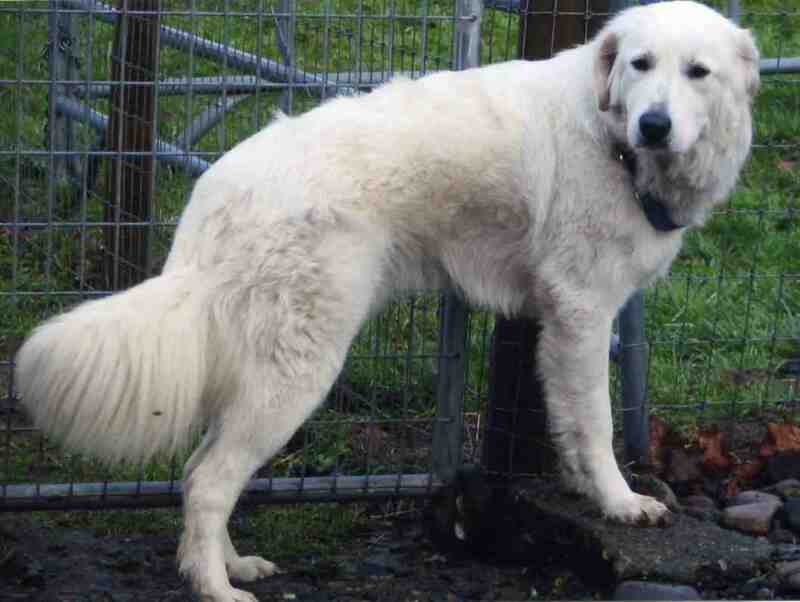 After we lost him, we got a male Great Pyrenees/Maremma cross from the Northwest Great Pyrenees Rescue. This group was wonderful to work with and we highly recommend them if you need a guardian dog! These dogs work together to guard the llamas and keep predators out. They also guard our property from strangers. We are really pleased with both of them. 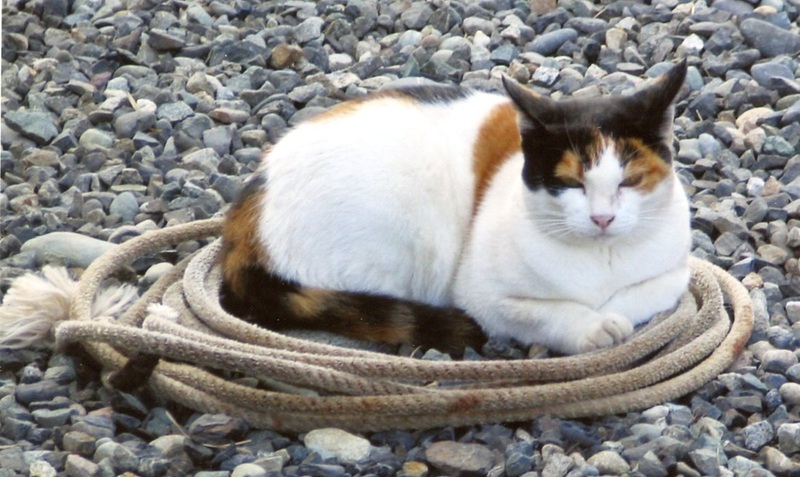 What farm is complete without it's "mouse specialists?" Mouser is 7lbs of pure kitty killing fury! She drags birds, bunnies, gophers and mice into our barn from the fields. 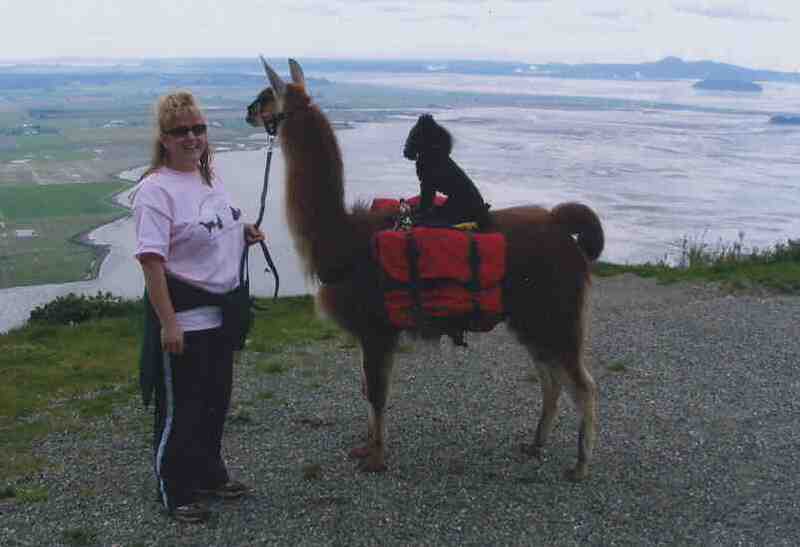 On occasion she has even stalked baby llamas! What five acre farm is complete without a John Deere? Jeff now has his horse, tractor and a Poodle, what else could a man want? This page was mostly reserved for non-llama pictures, but this picture was too neat. 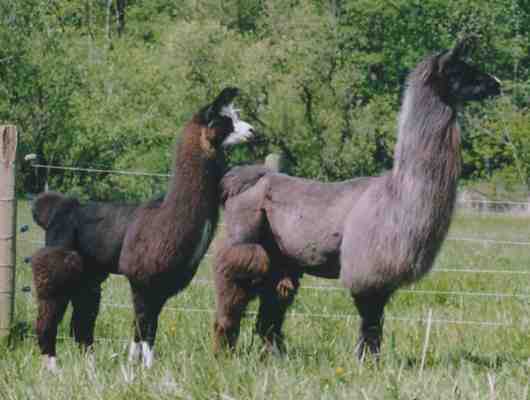 All of our llamas are favorites, but Nina and her daughter Chantika are extra special here. Nina was not only Niki's top girl, but Jeff's also! Her daughter Tika is left now as a big favorite and will stay here to replace her dam. We had to euthanize Nina in 7/11 due to age related issues. 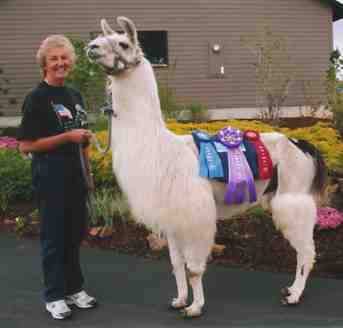 This is our good friend Donna with her performance llama Max. She and our other friend Linda used to run Llamas and More Catalog Store, but have since retired from their business. Donna started to show her boy Max after this. Sicily's 2013 Puppies born Christmas Day- Four black males and two white females!